Nichrome wire mesh attains the splendid features of excellent resistance to corrosion at the grand temperature levels. It attains minor temperature coefficient of expansion and large performance temperature limit. It provides tremendous resistance to carburization, thermal upset, drooping and bending. It has superior mechanical features and widely competent in producing secure oxide layer to resist corrosion. 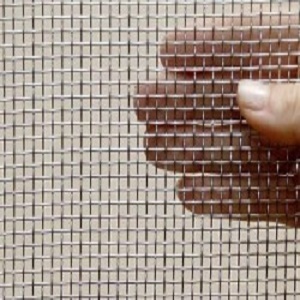 Nichrome wire mesh is an affordable resistance wire. It is primarily implemented in the production of industrial electric furnaces, domestic heating equipments and ceramics, heat processing and electronic operations. Nichrome Resistance Heating wire offers large electric resistance that increases significantly if temperature increases since it has large temperature coefficient of electric resistivity. The common applications of resistance heating wire include manufacturing powerful electric resistors and heating apparatus. The main purpose of resistance wire is to generate enormous heat when it is heated enormously. Nichrome Resistance Heating wire is a hard, dense material. It offers superior resistance to oxidation and many corrosive conditions at the high temperatures. It creates protective layer when heated at the high scale. The wire also introduces high performance temperature limit, prolonged service life and large stress capability.